I have a new job: My Mom’s publicist. Ok, so it’s not really a new job. But in the last two weeks, I have booked my Mom a newspaper interview, a TV interview, and a radio interview. It’s been a year and a half since my Dad passed away and last year was an extremely tough holiday season. It’s still hard, but this year has been better because Mom’s back from Taiwan and we are planning to spend the holidays together. 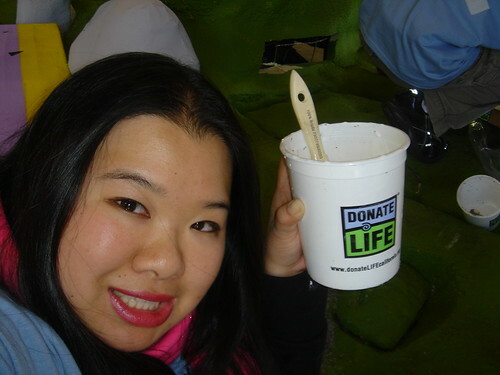 One of the things we have been doing together is volunteering for One Legacy/Donate Life. At the time that it was all going on, I didn’t want to talk about it very much but our family made the decision to honor my father’s wishes to donate all my father’s organs and tissues so that our loss could possibly help another family in crisis. One of the things we stipulated is that we not want to know who the recipients were: even though some families don’t feel this way, to us a donation is a donation and we felt that the compassionate thing to do was to try and help someone else if we could. The One Legacy/Donate Life folks have been absolutely wonderful and caring with us. They were so appreciative of the decision and have been following our family with kindness and caring, knowing that it was so hard to lose someone we loved so much. Throughout the past year, they have had many memorial events for organ donor families where we have met other families who have gone through similar situations as we have. One of the things that has become a little easier to do over time is to talk about it. Whereas we were extremely private about our decision at the time that we made it, especially in this time of year of giving, we think about the gift that my father was able to give as an organ and tissue donor. A few weeks ago, the One Legacy/Donate Life folks asked us to participate in the decoration of their annual Rose Parade Float. On this date, the “Ambassador” families (of those donors featured on the float) came to decorate the portraits of their loved ones. In some cases, donor families were introduced with recipient families: a very moving scene. On the same day, my Mom was asked to give an a TV interview (I don’t know which media outlet interviewed her; I just saw cameras pointed at her) and also to say some things on camera, possibly to be used for a public service announcement. We’ll see if that airs anywhere at some point in the future. While I was in NYC, I got a call that the Los Angeles Chinese radio station, KAZN 1300AM ä¸­æ–‡å»£æ’­é›»å° was going to do a piece on organ donation and wanted a donor family to speak along with a couple of recipient families. Since I was supposed to be in NYC at the time, I suggested that they interview my Mom for the piece instead. Last night, the radio segment aired and everyone said she did a great job telling the story of my father and our decision to donate. Lots of people have called her, including my Uncle Peter and various friends who just happened to hear her on the air. They said that she really touched them with our story and were inspired by my father’s noble and compassionate act to consent to being a donor and by our family’s decision to support that. I am so proud of my mother for giving voice to such an important cause and for being brave enough to talk about her loss and our father so publicly in the hopes of helping save more lives. She is an amazing woman and I love her so much. Hey, that is really cool! Thinking of you this holiday season. Way to go Auntie! Great job hooking her up, Joz! Lots of hugs and happy thoughts for you guys. I am with you all on donating organs. My cousin donated a kidney to his daughter. She will be needing another transplant when she gets older. That post brought tears to my eyes. What a wonderful way to honor the memory of your beloved father. A belated Merry Xmas and a Happy NY to you and your family.